We’ve been working hard on a powerful new integration with leading CRM Microsoft Dynamics 365. 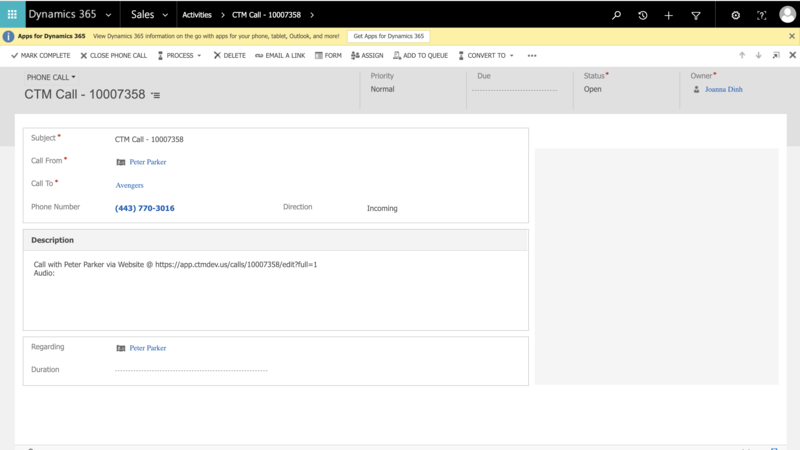 If your sales team engages in phone calls with leads and clients, they’ll be able to view contact record data from Microsoft Dynamics 365 directly within the CTM call log. With historic information directly available during the sales call, your team will be empowered to build their relationship, and close the deal sooner. This integration is also valuable for anyone running advertisements or marketing campaigns; our highly detailed attribution tools can sync with your leads, contacts, and campaigns in Microsoft Dynamics 365, to enhance your ROI reporting with valuable call data. This integration is available now! If you’d like to set it up on your Contact Center account, we’ve provided a step-by-step guide. Want to learn more? Our team will explore the Microsoft Dynamics integration with CTM in a live webinar on March 27 at 2pm. Register here!